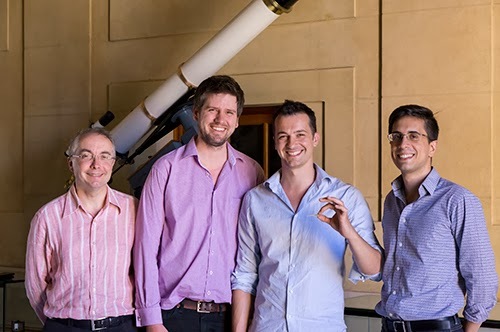 Professor Simon Fleming, Dr Boris Kuhlmey, Alessandro Tuniz and Dr Alexander Argyros have developed a metamaterial lens, a powerful tool for biological science. A lens with ten times the resolution of any current lens, making it a powerful new tool for the biological sciences has been developed by researchers at the University of Sydney. "This advance means we can unlock previously inaccessible information on the structure of molecules, their chemical make-up and the presence of certain proteins," said Alessandro Tuniz, lead author of an article on the lens published in Nature Communications today. Tuniz, a postdoctoral associate at the University, said, "This opens up an entirely new tool for biological studies. It could allow earlier skin cancer diagnosis, because smaller melanomas can be recognised. For breast cancer, it can also be used to more accurately check that all traces of a tumour have been cut out during surgery." The four member research team from the University's School of Physics, including Alessandro Tuniz, are all authors on the paper. They created the lens using fibre optic manufacturing technology. The lens is a metamaterial - a material with completely new properties not found in nature. Making the lens was not a matter of making a better form of the lenses already in existence ut of making a lens which uses light waves in a way not previously possible. "Creating metamaterials is a cutting-edge area of science with a massive range of potential uses from aerospace to solar power, telecommunications to defence," said researcher Dr Boris Kuhlmey. "The major challenge is making these materials on a scale that is useful. This is one of the first times a metamaterial with a real world application, quickly able to be realised, has been feasible. Within the next two to three years, new terahertz microscopes that are ten times more powerful than current ones will be possible using our metamaterial. "We know of only two or three other cases worldwide, including for wireless internet and MRI applications, where metamaterials could also be put into practice in the next couple of years." The potential to create a new high power lens, able to see much finer details than using conventional lenses was spotted almost a decade ago. It has taken until now to make the lens on a useful scale, a thousand times smaller than the early experimental models. "The difficulty was making large quantities of matter structured on a micrometric scale," said Alessandro Tuniz. The new lens, made of plastic and metal, uses terahertz waves, electromagnetic waves with frequencies higher than microwaves but lower than infrared radiation and visible light. It operates in a region of the spectrum where very few other optical tools are available and all of them have limitations, in particular in terms of resolution. "If we think of this in comparison to an X-ray which allows us to see inside objects at a high resolution but with associated danger from radiation, by contrast our metamaterial lens allows us not only to see through some opaque materials, but also to gather information on their chemical composition, and even information on interaction between certain molecules, without the danger of X-rays," Tuniz said. This means the lens is perfectly suited to analysing the delivery of drugs to cells, which is crucial to medical research.